Alchemical waters – stems from a residency Le Gear undertook while sailing the Arctic waters of Svalbard on a tall ship 2012 where she researched the micro and macro forces of ice in the retreating ice flows. 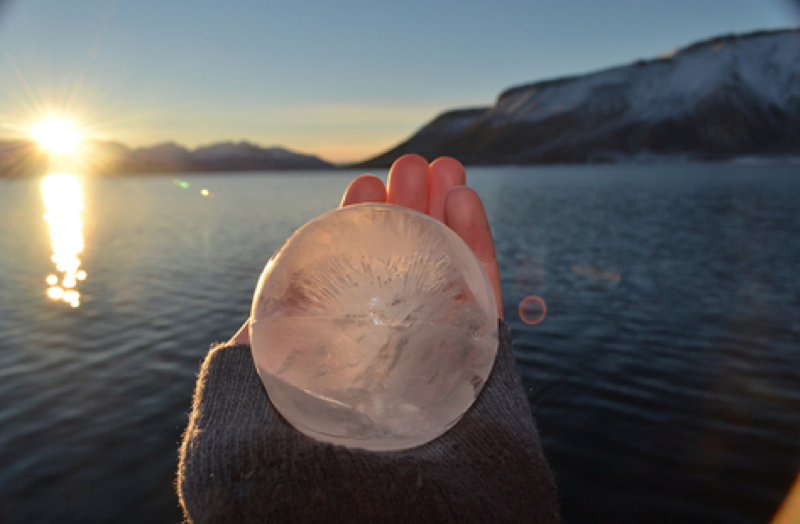 Le Gear explored the potentiality of ice in homeopathic water remedies and created a collection of homeopathic waters from melted iceberg waters which she then returned to the Arctic sea as a spherical frozen form, using the homeopathic ideas of treating like with like. It involves serial dilutions. Homeopathy’s law of infinitesimals says that the lower the concentration of a substance, the more potent it becomes. Le Gear also introduced this water remedy to other bodies of water in different parts of the world. Alchemical Waters is a meditative video work, which deliberately omits a panoramic view of icebergs, a quiet reference to the global situation of melting polars. The sound of melting icebergs creates part of the soundtrack, a poignantly quiet clicking sound inhabits the space. Alchemical Waters is a video piece in which a remedy from the melt waters of an iceberg was created in the Arctic, and then returned to the Arctic sea. The work engages with the subtle earth energies that ebb and flow through the landscape, creating a relationship with spirit and place.